What should I do if I'm in a personal injury accident? If you have been injured due to the negligence of someone else, there are a few important steps you should take. First and foremost, you should always seek medical attention. Even if you feel fine, if you've been injured at a casino, in a slip and fall accident, in a car crash, or another instance, you should get checked out by a doctor. This is to ensure you really are fine and to collect evidence as well. You should also take photos of the accident scene and get the contact information of any witnesses. And last but not least, contact an accident attorney in your area. After you've been injured and have decided to file a personal injury lawsuit, you should file your claim sooner rather than later. 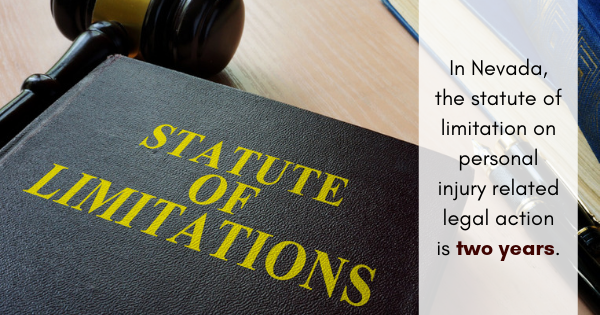 If you live in Nevada, the statute of limitation is two years for personal injury legal action. Filing as soon as possible is always a good idea. This way, the accident recently occurred, there is less time for evidence to get lost, and witnesses will have the event fresh in their memories. You should contact your lawyer and follow their instructions regarding filing the claim. Do all personal injury lawsuits require the help of a lawyer? From hotel and casino injuries to truck accidents and motorcycle crashes, there may be a wide variety of reasons to file a personal injury claim. But all personal injury cases have something in common: they're challenging. Personal injury cases can be extremely complex. You have to gather the right evidence, complete specific paperwork by certain deadlines, and have a strong enough case to prove fault. In these situations, the help of an experienced attorney is invaluable. They can help guide you through the process and give you the best chance at receiving fair compensation. Hopefully, this article provided some helpful answers regarding personal injury cases. If you've been injured and are looking to file a lawsuit, consider contacting Day Nance for your legal help.